Modular units are being installed at Coliseum Connections in Oakland. 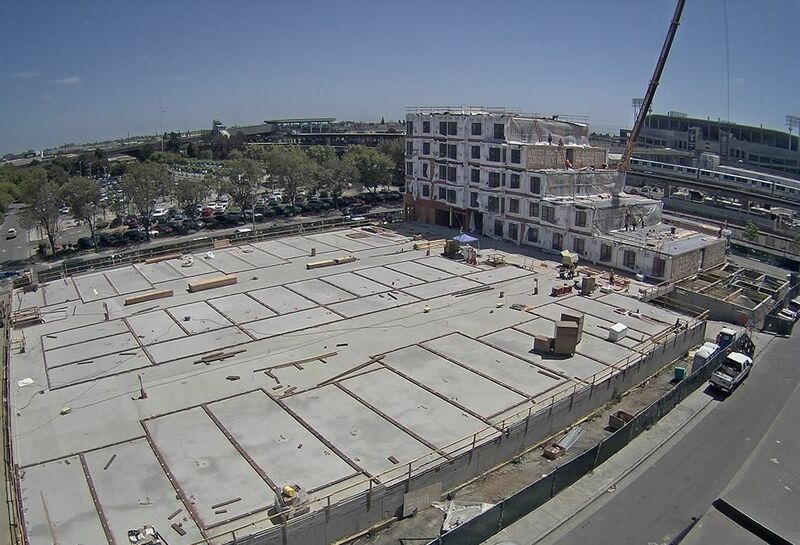 The $53M project, developed by a JV of UrbanCore and Oakland Economic Development Corp., will create 110 mixed-income units on a 1.3-acre Bay Area Rapid Transit-owned parking lot ground-leased to the JV. The modular units were built by Guerdon Enterprises out of Boise, Idaho. Completion of the modular unit placement is expected on June 29. The project is expected to be completed in January when occupancy also is expected to begin. Coliseum Connections is one of a handful of modular projects in the works or being planned in Oakland. Panoramic Interests plans to build over 1,000 units in West Oakland next to BART, and RAD Urban is planning two high-rises from steel modular units. The project at Snell Street and 71st Avenue will have 55 market-rate units with rents ranging from $1,900 to $2,400 for households earning 80% to 120% of the area median income; the other 55 units will be affordable with rents from $1,100 to $1,600 for households earning 50% to 60% of the area median income.